If you have an excess of glass bottles lying around in your home, don't throw them into the recycling bin just yet. With a little creativity and handiwork, you can make terrariums, hummingbird feeders, candle holders and fish tanks out of them. Not quite the crafty type? It still helps to have a glass bottle or two lying around. An empty glass bottle or wine bottle can be easily transformed into a houseplant water feeder for your plants when you're gone on vacation. And forget about spending money on a specialty rolling pin—any wine or glass bottle will do when it comes to rolling dough for your next baking project. 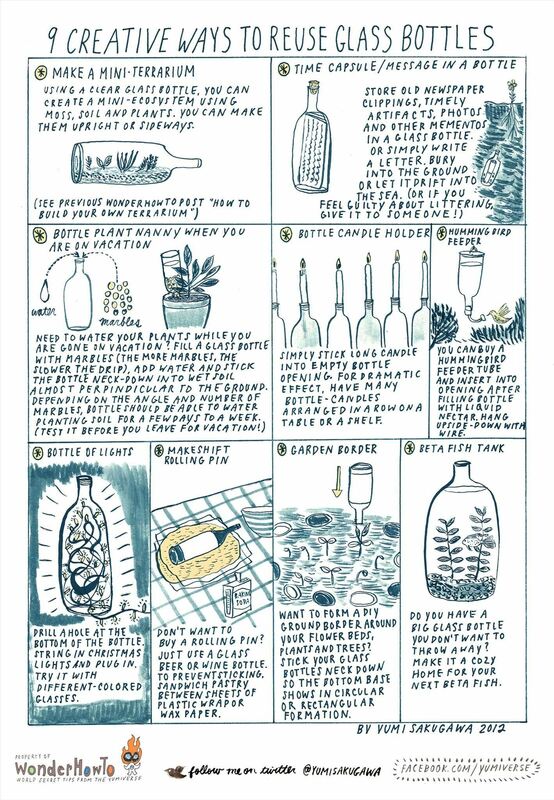 Got your own tips for reusing glass bottles? Share with us by commenting below!